Download "Guidance on the preparation of dossiers for harmonised classification and labelling"
4 4 Guidance on the preparation of CLH dossiers Version 2.0 August 2014 entries and harmonised classification for hazard classes/differentiations other than CMR and respiratory sensitisation. - Original Section 4 split into two new sections: Section 4 on the overview of the process and Section 5 on how to prepare a CLH dossier. - Creation of new subsections in Section 5 to provide specific information also on active substances in BP and in PPP in relation to the creation of CLH dossiers for those substances. - Deletion of subsection 4.6 on Classification based on impurities. The interpretation of the regulation is under discussion and guidance on the issue needs to be further agreed and developed. - Revision of original subsection 4.7 to reflect the progress achieved by the process development activities and the development of new templates and IT tools. - Transfer of original subsection 4.9 on What should an MSCA do if it considers that a CLH dossier is not appropriate? to new Section 9. - Revision of original Section 5 (now Section 6) to reflect the progress achieved by the process development activities. In particular, the difference between required and recommended revisions, which may be requested by ECHA following accordance check, has been introduced. The role of quality of dossiers in RAC opinion development has been clarified. - Creation of new Section 7 on the alignment of the CLH process with the processes under PPPR and BPR. The information provided in this section aims to align the review processes for active substances in BP and the peer review evaluation of active substances in PPP with the CLH process. - Reduction of original Section 6 (now Section 8) by eliminating the out-of-date subsection 6.2. 9 Guidance on the preparation of CLH dossiers Version 2.0 August RAR RCOM REACH Regulation RoI RMS SCL SIEF vpvb WHO Renewal Assessment Report Response to Comments Regulation (EC) No 1907/2006 of the European Parliament and of the Council of 18 December 2006 concerning the Registration, Evaluation, Authorisation and Restriction of Chemicals (REACH), establishing a European Chemicals Agency, amending Directive 1999/45/EC and repealing Council Regulation (EEC) No 793/93 and Commission Regulation (EC) No 1488/94 as well as Council Directive 76/769/EEC and Commission Directives 91/155/EEC, 93/67/EEC, 93/105/EC and 2000/21/EC Registry of Intentions Rapporteur Member State (for active substances in BP and PPP) Specific Concentration Limit Substance Information Exchange Forum Very Persistent and very Bioaccumulative World Health Organisation In this document, text cited from the CLP and REACH Regulations is indicated in green boxes. 10 10 Guidance on the preparation of CLH dossiers Version 2.0 August Introduction Regulation (EC) No. 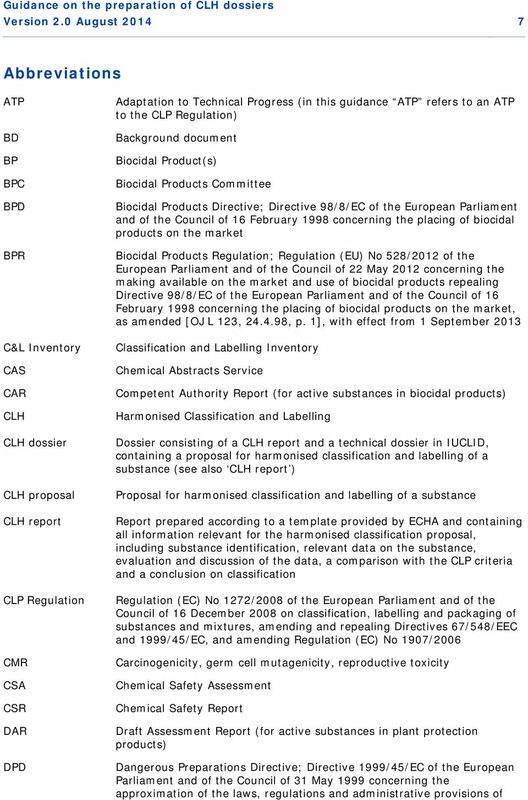 1272/2008 of the European Parliament and of the Council on classification, labelling and packaging of substances and mixtures (the CLP Regulation) entered into force on 20 January Title V of the CLP Regulation contains provisions for submission of proposals for harmonised classification & labelling. 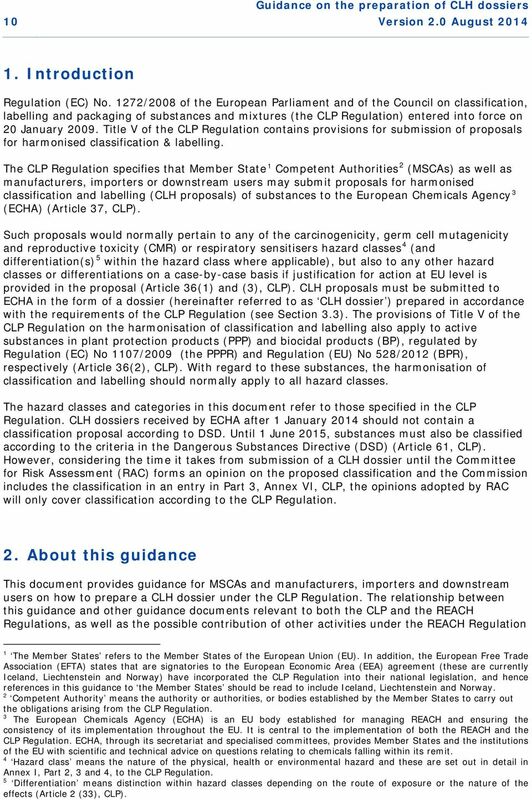 The CLP Regulation specifies that Member State 1 Competent Authorities 2 (MSCAs) as well as manufacturers, importers or downstream users may submit proposals for harmonised classification and labelling (CLH proposals) of substances to the European Chemicals Agency 3 (ECHA) (Article 37, CLP). Such proposals would normally pertain to any of the carcinogenicity, germ cell mutagenicity and reproductive toxicity (CMR) or respiratory sensitisers hazard classes 4 (and differentiation(s) 5 within the hazard class where applicable), but also to any other hazard classes or differentiations on a case-by-case basis if justification for action at EU level is provided in the proposal (Article 36(1) and (3), CLP). CLH proposals must be submitted to ECHA in the form of a dossier (hereinafter referred to as CLH dossier ) prepared in accordance with the requirements of the CLP Regulation (see Section 3.3). The provisions of Title V of the CLP Regulation on the harmonisation of classification and labelling also apply to active substances in plant protection products (PPP) and biocidal products (BP), regulated by Regulation (EC) No 1107/2009 (the PPPR) and Regulation (EU) No 528/2012 (BPR), respectively (Article 36(2), CLP). With regard to these substances, the harmonisation of classification and labelling should normally apply to all hazard classes. The hazard classes and categories in this document refer to those specified in the CLP Regulation. 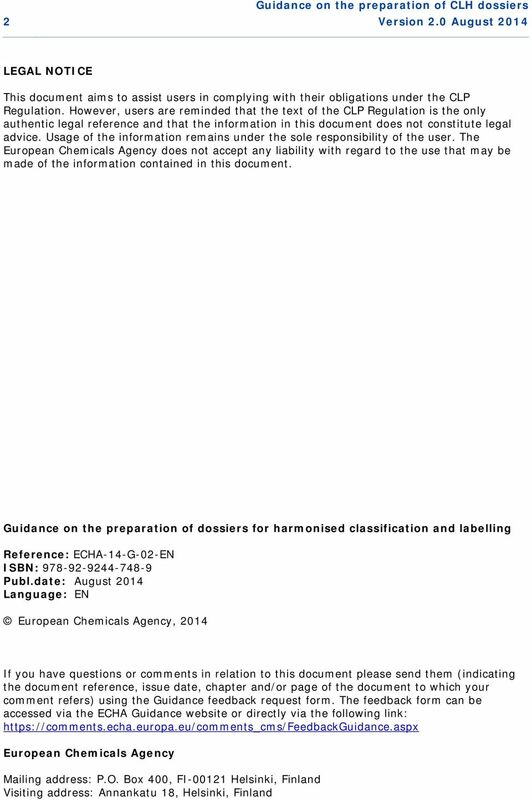 CLH dossiers received by ECHA after 1 January 2014 should not contain a classification proposal according to DSD. Until 1 June 2015, substances must also be classified according to the criteria in the Dangerous Substances Directive (DSD) (Article 61, CLP). However, considering the time it takes from submission of a CLH dossier until the Committee for Risk Assessment (RAC) forms an opinion on the proposed classification and the Commission includes the classification in an entry in Part 3, Annex VI, CLP, the opinions adopted by RAC will only cover classification according to the CLP Regulation. 2. About this guidance This document provides guidance for MSCAs and manufacturers, importers and downstream users on how to prepare a CLH dossier under the CLP Regulation. The relationship between this guidance and other guidance documents relevant to both the CLP and the REACH Regulations, as well as the possible contribution of other activities under the REACH Regulation 1 The Member States refers to the Member States of the European Union (EU). In addition, the European Free Trade Association (EFTA) states that are signatories to the European Economic Area (EEA) agreement (these are currently Iceland, Liechtenstein and Norway) have incorporated the CLP Regulation into their national legislation, and hence references in this guidance to the Member States should be read to include Iceland, Liechtenstein and Norway. 2 Competent Authority means the authority or authorities, or bodies established by the Member States to carry out the obligations arising from the CLP Regulation. 3 The European Chemicals Agency (ECHA) is an EU body established for managing REACH and ensuring the consistency of its implementation throughout the EU. It is central to the implementation of both the REACH and the CLP Regulation. ECHA, through its secretariat and specialised committees, provides Member States and the institutions of the EU with scientific and technical advice on questions relating to chemicals falling within its remit. 4 Hazard class means the nature of the physical, health or environmental hazard and these are set out in detail in Annex I, Part 2, 3 and 4, to the CLP Regulation. 5 Differentiation means distinction within hazard classes depending on the route of exposure or the nature of the effects (Article 2 (33), CLP). 12 12 Guidance on the preparation of CLH dossiers Version 2.0 August 2014 R.6: QSARs and grouping of chemicals can be found on the ECHA website at: 3. Links to relevant web pages: The latest version of IUCLID can be downloaded from the IUCLID website: CLP legislation on the ECHA website: CLH related information on the ECHA website: Registry of Intentions (RoI) web page: Web form for submitting an intention to the RoI: Web form for submitting the CLH dossier: Public consultation web page: Committee for Risk Assessment web page: Biocidal Products Committee web page: C&L Inventory and notification process: Dissemination web site for registered substances: EFSA website (pesticides section): 3. Scope and legal basis 3.1. Harmonised classification and labelling Harmonised classification and labelling for a substance means that a decision to classify and label 6 the substance in a particular hazard class (or, where applicable, differentiation(s) within a hazard class), has been taken at EU level. 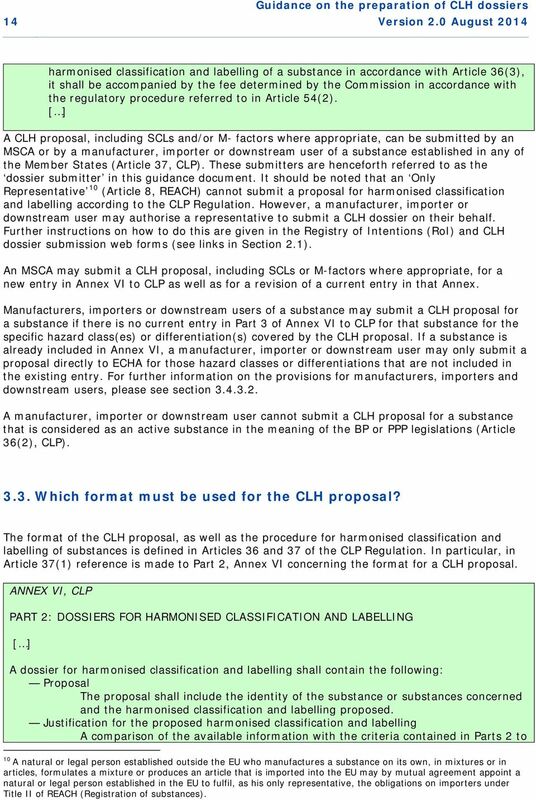 The harmonised classification and labelling is included as an entry in Part 3 of Annex VI to the CLP Regulation. 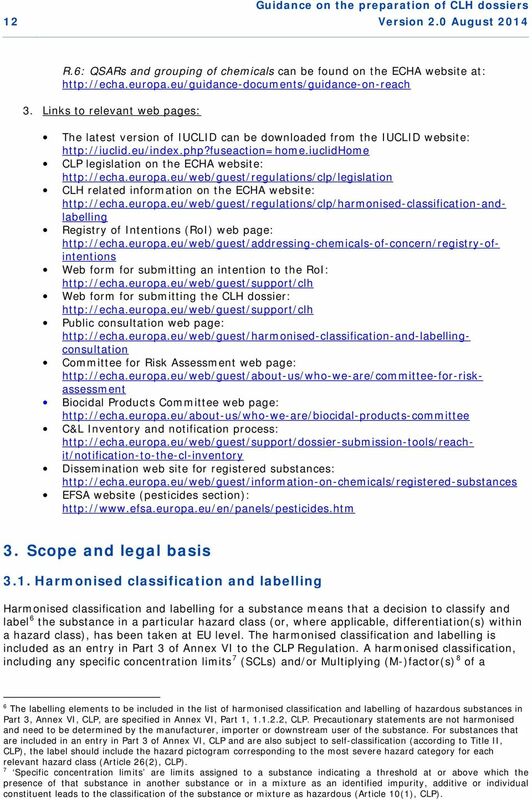 A harmonised classification, including any specific concentration limits 7 (SCLs) and/or Multiplying (M-)factor(s) 8 of a 6 The labelling elements to be included in the list of harmonised classification and labelling of hazardous substances in Part 3, Annex VI, CLP, are specified in Annex VI, Part 1, , CLP. Precautionary statements are not harmonised and need to be determined by the manufacturer, importer or downstream user of the substance. For substances that are included in an entry in Part 3 of Annex VI, CLP and are also subject to self-classification (according to Title II, CLP), the label should include the hazard pictogram corresponding to the most severe hazard category for each relevant hazard class (Article 26(2), CLP). 7 Specific concentration limits are limits assigned to a substance indicating a threshold at or above which the presence of that substance in another substance or in a mixture as an identified impurity, additive or individual constituent leads to the classification of the substance or mixture as hazardous (Article 10(1), CLP). 13 Guidance on the preparation of CLH dossiers Version 2.0 August substance must be used by all suppliers of that substance within the EU. This means that self-classification of a substance must be performed only for those hazard classes or differentiations which are not yet included in an Annex VI entry for the substance. For hazard classes (or, where applicable, differentiation(s) within a hazard class) not covered by an entry in Annex VI to the CLP Regulation, suppliers are responsible for the classification and labelling before placing the substance on the market (Article 4(3) CLP). This means that for substances placed on the market that meet the criteria for classification in one or more of those hazard classes (or differentiation(s) within a hazard class where applicable), a selfclassification must be conducted. Self-classification must also be conducted for substances that are not placed on the market but are subject to registration according to the REACH Regulation. The self-classification must be conducted by manufacturers, importers and downstream users of the substance in accordance with the criteria for classification as laid out in Annex I to the CLP Regulation (Article 1(1)(b), CLP). Guidance on how to carry out the selfclassification can be found in the Introductory guidance on the CLP Regulation and in the Guidance on the application of the CLP Criteria (for links, see Section 2.1). Special provisions apply in cases where only a minimum classification 9 for a substance exists for one or more hazard classes or where specific notes have been added to the entry in Annex VI, CLP (1.1.3, Part 1, Annex VI, CLP). Articles 36 and 37 of the CLP Regulation give the specific provisions for the procedure for CLH proposals. They provide information on who can submit a proposal, for which substances a proposal can be submitted as well as for which hazard classes, or differentiations within a hazard class, a proposal can be submitted. There is also information on the format to be used for the proposal, the timelines within which a decision has to be taken as well as specific cases where the proposal is to be accompanied by a fee Who can submit a CLH proposal? Article 37, CLP Procedure for harmonisation of classification and labelling of substances 1. A competent authority may submit to the Agency a proposal for harmonised classification and labelling of substances and, where appropriate, specific concentration limits or M-factors, or a proposal for a revision thereof. [ ] 2. A manufacturer, importer or downstream user of a substance may submit to the Agency a proposal for harmonised classification and labelling of that substance and, where appropriate, specific concentration limits or M-factors, provided that there is no entry in Part 3 of Annex VI for such a substance in relation to the hazard class or differentiation covered by that proposal. [ ] 3. Where the proposal of the manufacturer, importer or downstream user concerns the 8 M-factor means a multiplying factor. It is applied to the concentration of a substance classified as hazardous to the aquatic environment acute category 1 or chronic category 1, and is used to derive by the summation method the classification of a mixture in which the substance is present (Article 10(2), CLP). 9 For certain hazard classes, including acute toxicity and STOT repeated exposure, the classification according to the criteria in DSD does not correspond directly to the classification in a hazard class and category under the CLP Regulation. In these cases, the harmonised classification in Annex VI to CLP must be considered as a minimum classification. Minimum classification for a category is indicated by the reference * in the column Classification in Table 3.1., Annex VI, CLP (Section 1.2.1, Annex VI, CLP). 14 14 Guidance on the preparation of CLH dossiers Version 2.0 August 2014 harmonised classification and labelling of a substance in accordance with Article 36(3), it shall be accompanied by the fee determined by the Commission in accordance with the regulatory procedure referred to in Article 54(2). [ ] A CLH proposal, including SCLs and/or M- factors where appropriate, can be submitted by an MSCA or by a manufacturer, importer or downstream user of a substance established in any of the Member States (Article 37, CLP). These submitters are henceforth referred to as the dossier submitter in this guidance document. It should be noted that an Only Representative 10 (Article 8, REACH) cannot submit a proposal for harmonised classification and labelling according to the CLP Regulation. However, a manufacturer, importer or downstream user may authorise a representative to submit a CLH dossier on their behalf. Further instructions on how to do this are given in the Registry of Intentions (RoI) and CLH dossier submission web forms (see links in Section 2.1). 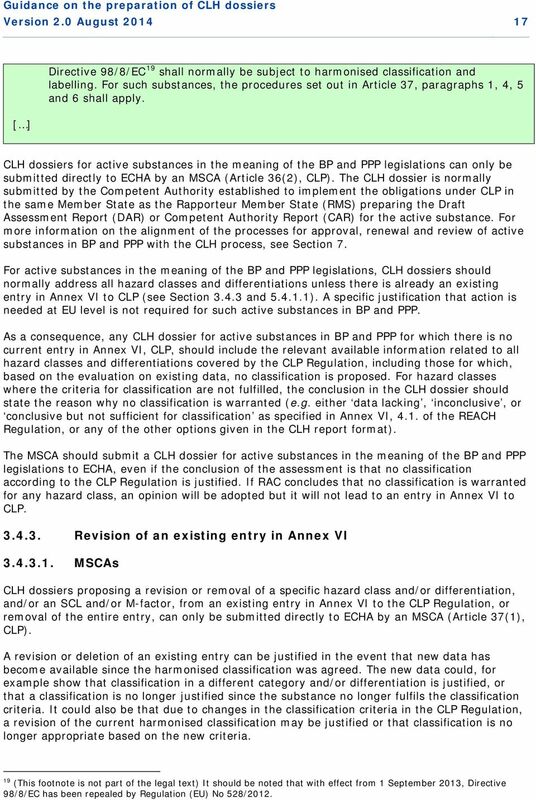 An MSCA may submit a CLH proposal, including SCLs or M-factors where appropriate, for a new entry in Annex VI to CLP as well as for a revision of a current entry in that Annex. Manufacturers, importers or downstream users of a substance may submit a CLH proposal for a substance if there is no current entry in Part 3 of Annex VI to CLP for that substance for the specific hazard class(es) or differentiation(s) covered by the CLH proposal. If a substance is already included in Annex VI, a manufacturer, importer or downstream user may only submit a proposal directly to ECHA for those hazard classes or differentiations that are not included in the existing entry. 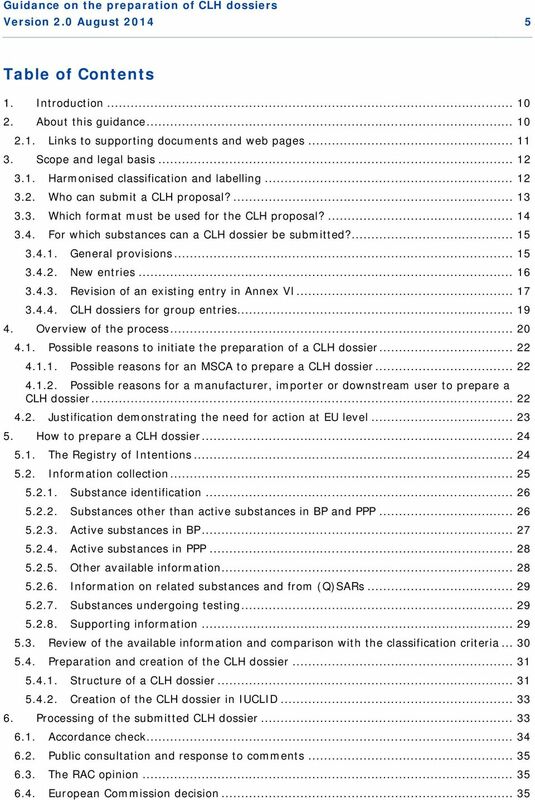 For further information on the provisions for manufacturers, importers and downstream users, please see section A manufacturer, importer or downstream user cannot submit a CLH proposal for a substance that is considered as an active substance in the meaning of the BP or PPP legislations (Article 36(2), CLP) Which format must be used for the CLH proposal? 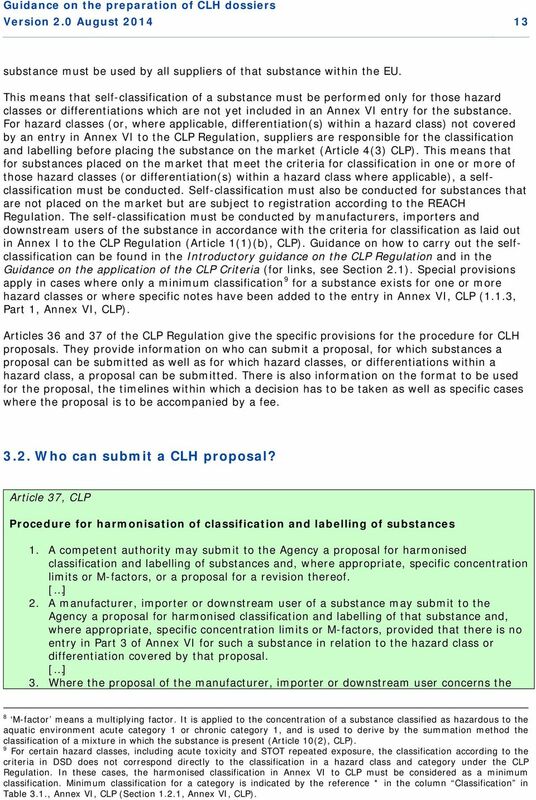 The format of the CLH proposal, as well as the procedure for harmonised classification and labelling of substances is defined in Articles 36 and 37 of the CLP Regulation. In particular, in Article 37(1) reference is made to Part 2, Annex VI concerning the format for a CLH proposal. ANNEX VI, CLP PART 2: DOSSIERS FOR HARMONISED CLASSIFICATION AND LABELLING [ ] A dossier for harmonised classification and labelling shall contain the following: Proposal The proposal shall include the identity of the substance or substances concerned and the harmonised classification and labelling proposed. Justification for the proposed harmonised classification and labelling A comparison of the available information with the criteria contained in Parts 2 to 10 A natural or legal person established outside the EU who manufactures a substance on its own, in mixtures or in articles, formulates a mixture or produces an article that is imported into the EU may by mutual agreement appoint a natural or legal person established in the EU to fulfil, as his only representative, the obligations on importers under Title II of REACH (Registration of substances). 15 Guidance on the preparation of CLH dossiers Version 2.0 August , taking into account the general principles in Part 1, of Annex I to this Regulation shall be completed and documented in the format set out in Part B of the Chemical Safety Report in Annex I to Regulation (EC) No 1907/2006. Justification for other effects at Community level For other effects than carcinogenity, mutagenicity, reprotoxicity and respiratory sensitisation a justification shall be provided that there is a need for action demonstrated at Community level. This does not apply for an active substance in the meaning of Directive 91/414/EEC 11 or Directive 98/8/EC 12. Any CLH proposal submitted to ECHA must be prepared in the format of a CLH dossier. A specific CLH report format has been developed by ECHA, with the intention of streamlining the process whilst assisting dossier submitters and RAC by ensuring that all relevant information is included. The format is the same for all the dossier submitters. Any CLH dossiers submitted to ECHA must consist of: i. a technical dossier created in IUCLID 13 (see Section ); and ii. a CLH report attached to it (see Section ). When preparing the technical dossier, the dossier submitter should ensure that the latest version of IUCLID is used. The latest version of IUCLID can be found on the IUCLID website (see link in Section 2.1). 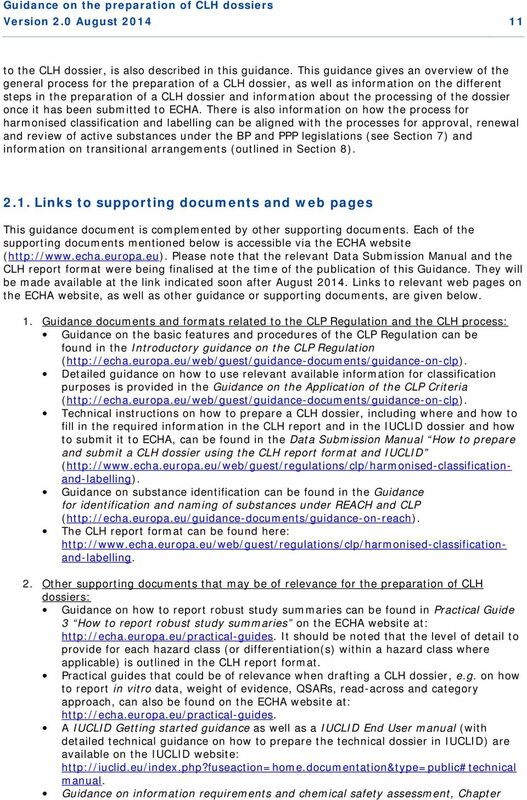 The CLH report must be prepared in the CLH report format as provided by ECHA on the ECHA website (see link in Section 2.1). Further details on how to prepare the dossier are provided in Section For which substances can a CLH dossier be submitted? General provisions In principle, CLH dossiers can be submitted to ECHA for any substance (or group of substances) within the scope of the CLP Regulation, irrespective of the tonnage manufactured or imported. An MSCA, manufacturer, importer or downstream user can decide to prepare a CLH dossier at their own initiative, taking into account Section 3.2 Who can submit a CLH proposal?. A CLH dossier, according to the CLP Regulation can only be submitted for a substance 14, or a group of substances, and not for a mixture 15. As alloys are considered mixtures for the purposes of the CLP Regulation (Article 2(27), CLP), CLH dossiers cannot be submitted for alloys. 11 (This footnote is not part of the legal text) It should be noted that with effect from 14 June 2011, Directive 91/414/EEC has been repealed by Regulation (EC) No 1107/ (This footnote is not part of the legal text) It should be noted that with effect from 1 September 2013, Directive 98/8/EC has been repealed by Regulation (EU) No 528/ IUCLID is the international standard database for capturing, managing and exchanging data on properties of chemicals. 14 According to Article 2(7) of CLP Substance means a chemical element and its compounds in the natural state or obtained by any manufacturing process, including any additive necessary to preserve its stability and any impurity deriving from the process used, but excluding any solvent, which may be separated without affecting the stability of the substance or changing its composition. 15 According to Article 2(8) of CLP Mixture means a mixture or solution composed of two or more substances. 16 16 Guidance on the preparation of CLH dossiers Version 2.0 August New entries Substances other than active substances in BP or PPP Article 36, CLP Harmonisation of classification and labelling of substances 1. A substance that fulfils the criteria set out in Annex I for the following shall normally be subject to harmonised classification and labelling in accordance with Article 37: [ ] (a) respiratory sensitisation, category 1 16 (Annex I, section 3.4); (b) germ cell mutagenicity, category 1A, 1B or 2 (Annex I, section 3.5); (c) carcinogenicity, category 1A, 1B or 2 (Annex I, section 3.6); (d) reproductive toxicity, category 1A, 1B or 2 (Annex I, section 3.7). One of the main objectives of CLH is to focus on substances and hazards of highest concern (Recital 52, CLP). Since CMR and respiratory sensitisation are the hazard classes of greatest concern, ECHA recommends that dossier submitters systematically assess all CMR and respiratory sensitisation (category 1A and 1B) hazard classes for any type of substance. The dossier submitter can then draw conclusions on whether or not the substance fulfils the criteria for classification in these hazard classes (Part 3, Annex I, CLP). If the dossier submitter does not assess all CMR and respiratory sensitisation hazard classes in the dossier, it is recommended to add a brief reasoning as to why a particular hazard class was not assessed. The reasoning could be, for example, that no data are available for that specific hazard class. Harmonised classification and labelling for hazard classes other than CMR and respiratory sensitisation may be proposed on a case-by-case basis if it is justified that action is needed at EU level (Article 36(3), CLP) (see Section 4.2). For a CLH dossier submitted by an MSCA covering hazard classes other than CMR and respiratory sensitisation, no fee is to be paid. However, if a CLH proposal submitted by a manufacturer, importer or downstream user concerns the harmonised classification and labelling of a substance in accordance with Article 36(3), CLP, i.e. hazard classes or differentiations other than CMR or respiratory sensitisation, it must be accompanied by the required fee (Article 37(3), CLP). The fee to be paid to ECHA is laid down in the Fee Regulation Active substances in BP or PPP Article 36, CLP Harmonisation of classification and labelling of substances [ ] 2. A substance that is an active substance in the meaning of Directive 91/414/EEC 18 or 16 (This footnote is not part of the legal text) The 2 nd ATP to CLP amended the differentiations for respiratory sensitisation to include category 1A and 1B. 17 The Fee Regulation (Regulation (EU) No 440/2010) is a separate Commission Regulation on the fees payable to ECHA in accordance with CLP Regulation. 18 (This footnote is not part of the legal text) It should be noted that with effect from 14 June 2011, Directive 91/414/EEC has been repealed by Regulation (EC) No 1107/2009. 17 Guidance on the preparation of CLH dossiers Version 2.0 August [ ] Directive 98/8/EC 19 shall normally be subject to harmonised classification and labelling. For such substances, the procedures set out in Article 37, paragraphs 1, 4, 5 and 6 shall apply. CLH dossiers for active substances in the meaning of the BP and PPP legislations can only be submitted directly to ECHA by an MSCA (Article 36(2), CLP). The CLH dossier is normally submitted by the Competent Authority established to implement the obligations under CLP in the same Member State as the Rapporteur Member State (RMS) preparing the Draft Assessment Report (DAR) or Competent Authority Report (CAR) for the active substance. For more information on the alignment of the processes for approval, renewal and review of active substances in BP and PPP with the CLH process, see Section 7. For active substances in the meaning of the BP and PPP legislations, CLH dossiers should normally address all hazard classes and differentiations unless there is already an existing entry in Annex VI to CLP (see Section and ). A specific justification that action is needed at EU level is not required for such active substances in BP and PPP. 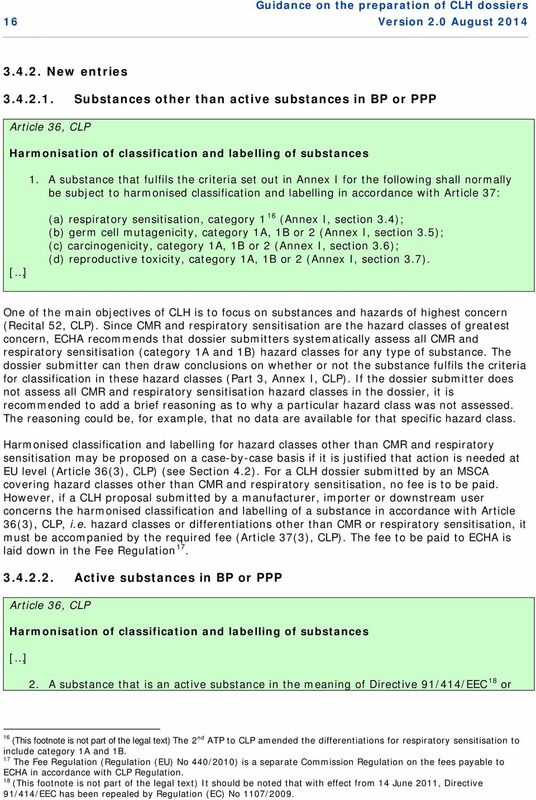 As a consequence, any CLH dossier for active substances in BP and PPP for which there is no current entry in Annex VI, CLP, should include the relevant available information related to all hazard classes and differentiations covered by the CLP Regulation, including those for which, based on the evaluation on existing data, no classification is proposed. For hazard classes where the criteria for classification are not fulfilled, the conclusion in the CLH dossier should state the reason why no classification is warranted (e.g. either data lacking, inconclusive, or conclusive but not sufficient for classification as specified in Annex VI, 4.1. of the REACH Regulation, or any of the other options given in the CLH report format). 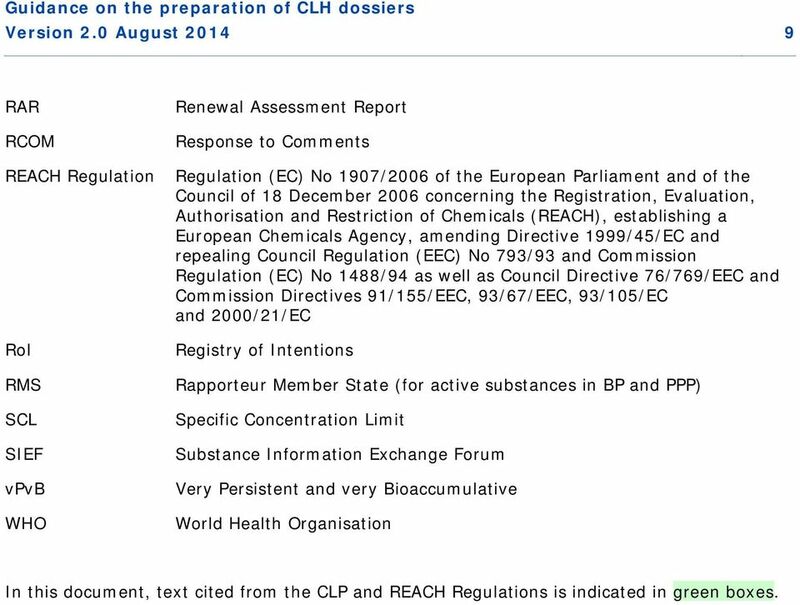 The MSCA should submit a CLH dossier for active substances in the meaning of the BP and PPP legislations to ECHA, even if the conclusion of the assessment is that no classification according to the CLP Regulation is justified. If RAC concludes that no classification is warranted for any hazard class, an opinion will be adopted but it will not lead to an entry in Annex VI to CLP Revision of an existing entry in Annex VI MSCAs CLH dossiers proposing a revision or removal of a specific hazard class and/or differentiation, and/or an SCL and/or M-factor, from an existing entry in Annex VI to the CLP Regulation, or removal of the entire entry, can only be submitted directly to ECHA by an MSCA (Article 37(1), CLP). A revision or deletion of an existing entry can be justified in the event that new data has become available since the harmonised classification was agreed. The new data could, for example show that classification in a different category and/or differentiation is justified, or that a classification is no longer justified since the substance no longer fulfils the classification criteria. It could also be that due to changes in the classification criteria in the CLP Regulation, a revision of the current harmonised classification may be justified or that classification is no longer appropriate based on the new criteria. 19 (This footnote is not part of the legal text) It should be noted that with effect from 1 September 2013, Directive 98/8/EC has been repealed by Regulation (EU) No 528/2012. 19 Guidance on the preparation of CLH dossiers Version 2.0 August of Annex VI shall submit a proposal in accordance with the second subparagraph of paragraph 2 to the competent authority in one of the Member States in which the substance is placed on the market. [ ] A manufacturer, importer or downstream user cannot submit a CLH dossier proposing a revision or removal of a specific hazard class and/or differentiation, and/or an SCL and/or M- factor, from an existing entry in Annex VI to the CLP Regulation, or the removal of an entire entry directly to ECHA (Article 36(2), CLP). 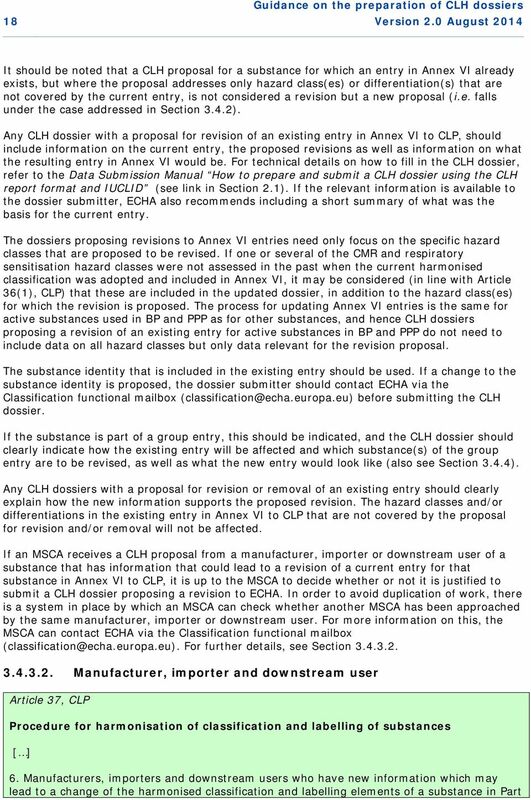 If the manufacturer, importer or downstream user has information that could lead to a revision of an existing entry in Annex VI to CLP, as specified above, they must instead submit a CLH proposal (in line with Article 36(2), CLP) to the MSCA in one of the Member States in which the substance is placed on the market (Article 37(6), CLP). The MSCA will then decide if, based on the new information, it is appropriate to prepare a CLH dossier and submit it to ECHA in order to revise the existing harmonised classification. There is a system in place in which an MSCA can check whether another MSCA has been approached by the same manufacturer, importer or downstream user, in order to avoid duplication of work. If a manufacturer, importer or downstream user has information that could lead to an addition of hazard classes and/or differentiations to the already existing entry, they can prepare a CLH dossier and submit it to ECHA. Information on the existing entry as well as information on what the resulting entry in Annex VI, CLP, would look like should then be included in the CLH dossier. 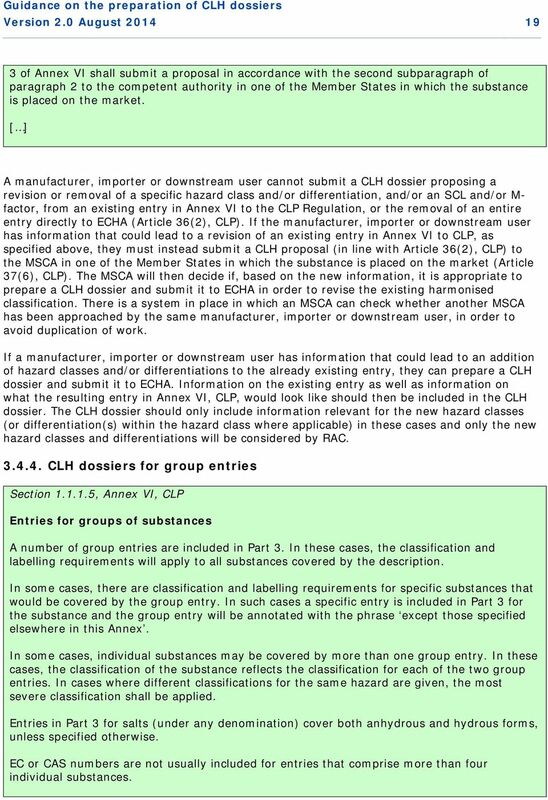 The CLH dossier should only include information relevant for the new hazard classes (or differentiation(s) within the hazard class where applicable) in these cases and only the new hazard classes and differentiations will be considered by RAC CLH dossiers for group entries Section , Annex VI, CLP Entries for groups of substances A number of group entries are included in Part 3. In these cases, the classification and labelling requirements will apply to all substances covered by the description. In some cases, there are classification and labelling requirements for specific substances that would be covered by the group entry. In such cases a specific entry is included in Part 3 for the substance and the group entry will be annotated with the phrase except those specified elsewhere in this Annex. In some cases, individual substances may be covered by more than one group entry. In these cases, the classification of the substance reflects the classification for each of the two group entries. In cases where different classifications for the same hazard are given, the most severe classification shall be applied. Entries in Part 3 for salts (under any denomination) cover both anhydrous and hydrous forms, unless specified otherwise. EC or CAS numbers are not usually included for entries that comprise more than four individual substances. 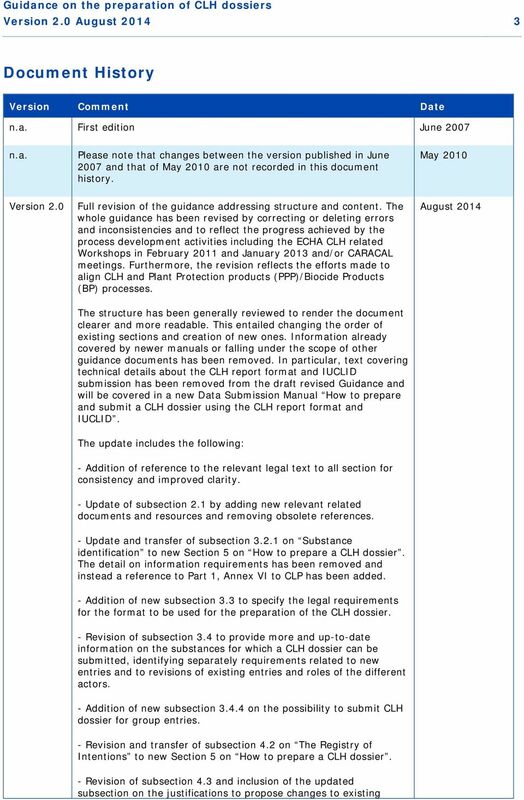 20 20 Guidance on the preparation of CLH dossiers Version 2.0 August 2014 It is possible to submit a CLH dossier for a group of substances (Section , Annex VI, CLP). In these cases, the classification and labelling requirements will apply to all substances that are part of the group. The identity of the group and the scope of the resulting entry in Annex VI to CLP need to be clearly indicated in the CLH dossier. If the aim is to have all substances included in the same entry (i.e. a group entry), one CLH dossier including all substances can be submitted. If, however, the aim is to have the CLH proposal resulting in several entries, one dossier per entry should be submitted. Before submitting a CLH dossier for a group of substances, the dossier submitter is strongly advised to discuss with ECHA the most appropriate way to prepare the dossier. 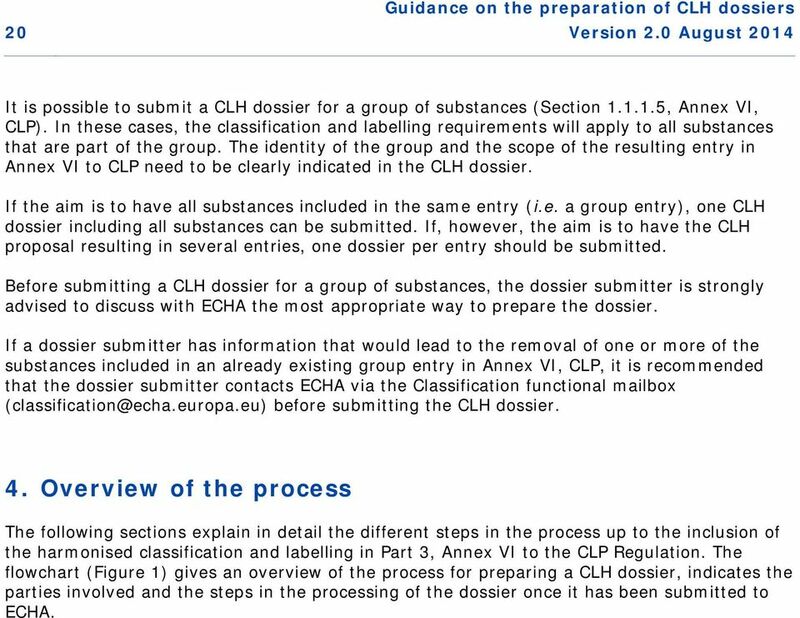 If a dossier submitter has information that would lead to the removal of one or more of the substances included in an already existing group entry in Annex VI, CLP, it is recommended that the dossier submitter contacts ECHA via the Classification functional mailbox before submitting the CLH dossier. 4. Overview of the process The following sections explain in detail the different steps in the process up to the inclusion of the harmonised classification and labelling in Part 3, Annex VI to the CLP Regulation. The flowchart (Figure 1) gives an overview of the process for preparing a CLH dossier, indicates the parties involved and the steps in the processing of the dossier once it has been submitted to ECHA. 22 22 Guidance on the preparation of CLH dossiers Version 2.0 August Possible reasons to initiate the preparation of a CLH dossier Possible reasons for an MSCA to prepare a CLH dossier An MSCA may have several reasons for deciding to prepare a CLH dossier. For example, an MSCA may: carry out a substance evaluation under the REACH Regulation and conclude that the substance is a CMR substance or respiratory sensitiser, or that classification and labelling in another hazard class (or differentiation(s) within a hazard class where applicable) may be justified; and/or carry out an evaluation on an active substance in BP or PPP (for alignment with the CLH process, see Section 7); and/or discover that new information is available that could justify a revision of a current harmonised classification and labelling of a substance, e.g. via a registration submitted in accordance with the REACH Regulation; and/or receive a proposal and/or dossier from a manufacturer, importer or downstream user which has new information that could lead to a change in the current harmonised classification and labelling (Article 37(6), CLP); and/or discover that there are different self-classifications notified in the Classification and Labelling (C&L) Inventory 20 for the same substance and there are indications that the notifiers are unable to come to an agreement despite every effort having been made to do so; and/or discover that the data may no longer support the conditions on which a minimum classification has been applied to an existing entry (1.2.1, Annex VI, CLP); and/or discover that the classification and labelling criteria in the CLP Regulation have changed for a particular hazard class and application of the new criteria would lead to different classification and labelling for a substance with an existing entry in Part 3, Annex VI, CLP. 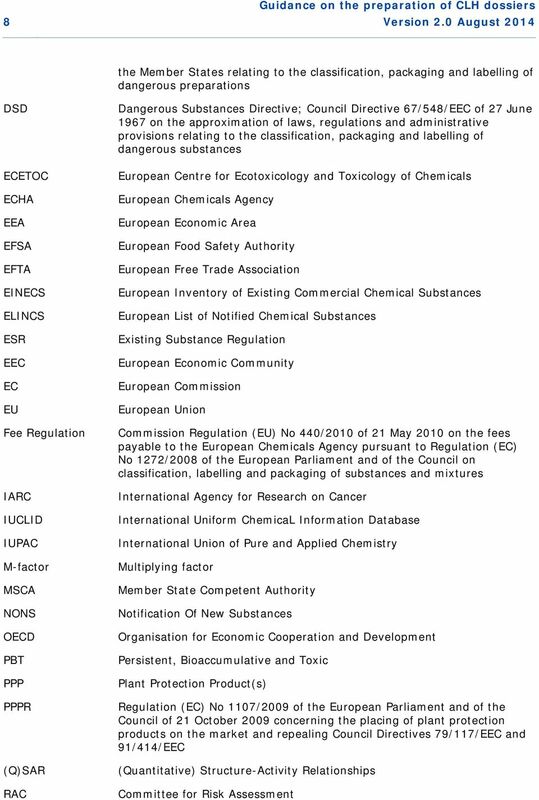 This list of examples is not exhaustive and an MSCA may have other reasons for preparing a CLH dossier Possible reasons for a manufacturer, importer or downstream user to prepare a CLH dossier A CLH dossier can be prepared and submitted to ECHA by a manufacturer, importer or downstream user of a substance (non-exhaustive list): if it is concluded that the substance fulfils the criteria for classification in any of the CMR or respiratory sensitisation hazard classes/differentiations; if a harmonised classification and labelling in another hazard class/differentiation than CMR and respiratory sensitisation is considered justified (also see Section 4.2); if it is discovered that there are different self-classifications notified in the C&L inventory for the substance, and there are indications that the notifiers are unable to come to an agreement despite every effort being made to do so. 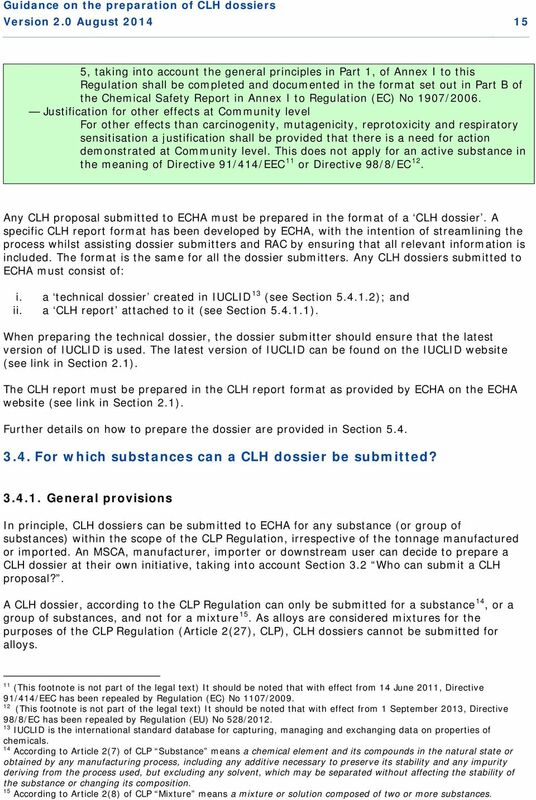 As described in Section 3.4.3, CLH dossiers proposing revision and/or removal of part of or an 20 The C&L Inventory is a database established and maintained by ECHA according to Article 42 of CLP. It contains basic classification and labelling information on notified and registered substances. 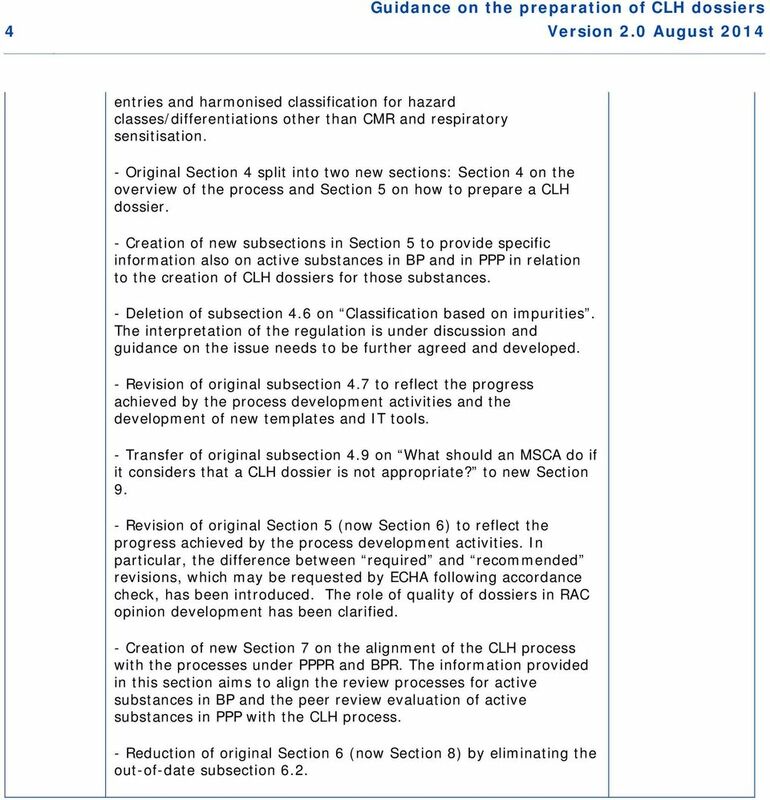 It also contains the harmonised classifications in Annex VI to the CLP Regulation. The obligations for the information to be included in the notification to the C&L Inventory are set out in Article 40, CLP.